NOTE: Another memorial service will be held at Unity Church in Albany at a future date to be determined. Jane Bloom passed away peacefully on June 24, 2018 after losing a difficult battle with cancer. Thankfully, she was comfortable and in the company of family members and her beloved pastor. She is survived by her daughters, Marcela Bloom and Monica Bloom, grandson Robert Francis Pugsley IV, sister Mary Elizabeth Crawford, brother David Van de Water and sister-in-law Seline Skoug, along with many nieces, nephews and cousins. She is predeceased by her husband Martin Bloom, her mother and father, Mary Ada and Harman Van de Water, and brother Robert Van de Water. Jane was born in Poughkeepsie NY on September 15, 1948, and grew up in Bogota NJ and Wilbraham MA, where she attended St. Joseph’s School and Minnechaug Regional High School. She later lived in Beverly and Amesbury MA, where she raised her two daughters and became an avid soccer fan—watching them develop as athletes and grow into accomplished young women. She has been a resident of Arlington VT for the past seven years. 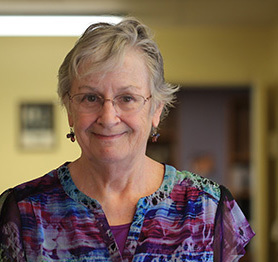 Throughout her adult life, Jane was committed to the education and spiritual development of young people, many with learning disabilities or other educational challenges. For more than 30 years, she was a teacher, counselor and administrator at Landmark School in Pride’s Crossing and Manchester-by-the-Sea MA, one of North America’s leading institutions for the education of learning-disabled students. As director of Landmark’s Expressive Language Program, Jane helped pioneer effective methods for teaching students with dyslexia and was the mentor and tutor of hundreds of learning-disabled students who went on to successful academic and professional careers. Following her work at Landmark, her focus turned toward spirituality and the study of biblical history. She was a Licensed Unity Teacher and Certified Spiritual Educator, serving as Youth and Family Ministry Director at Unity Church of Albany. Prior to that, she taught children at Unity on the River in Amesbury MA. Jane received a bachelor’s degree in Fine Art from the University of Massachusetts, Amherst and a masters degree in education from Simmons College. American Association of University Women. Most importantly, Jane was a kind and a gentle spirit, generous friend, industrious colleague and thoughtful mentor. Her bright smile and sardonic wit will be sorely missed. I remember you often in my days and smile. I challenge myself more and think, what would Jane do? She’s keep going Genie!!! You inspired me to be my best Jane. Love you always.